Paraplegia - My Experience: Do-it-Yourself Wheelchair Repair when Professionals are Unavailable. Permobil -Need I say more? 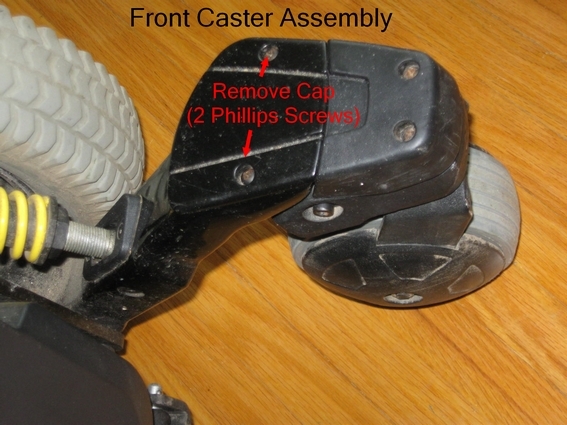 Do-it-Yourself Wheelchair Repair when Professionals are Unavailable. Two week waiting list!! Having moved to a new town, I call up the local wheelchair repair service of the franchise I have been using for the last few years (Motion Specialties). Those who may be bored enough to follow this blog know that I had high praise for the franchise after my dreadful experience with Shopper's Home Healthcare. I say "call up" however I first filled out their On-line Form requesting service, then with no reply, the next day I call their office only to find myself punching buttons to reach inappropriate voice mails (with no cue as to when to start speaking). Still no reply, I send an e-mail and ask for a call-back. Some time on the third day I get a e-mail (no call-back) telling me that the next available time-slot for a house call would be in the afternoon -IN TWO WEEKS TIME! I`ve found out that their preferred mode of communication is via e-mail. Who knew! My first experience was fairly positive. I wanted to introduce myself to their system so I unknowingly started by sending an e-mail with a summary of my problem, my make of powerchair, my address, etc, etc. The response was fairly prompt - within a day or so. However, two weeks to receive a service call is unacceptable as anyone who is dependent on a wheelchair knows that the wheels are your life. The phone situation was also unacceptable as if I become stuck in a sewer grate while crossing Main Street during rush hour during a rain storm while short of meds - I have to have some sort of emergency number to call which will respond promptly by phone, if not by service. No emergency number was offered when calling their business. No option to speak to a real live person was available. I understand that the bulk of Shopper`s Home Healthcare clients were dumped upon Motion Specialties when Shopper`s abruptly closed without notice. 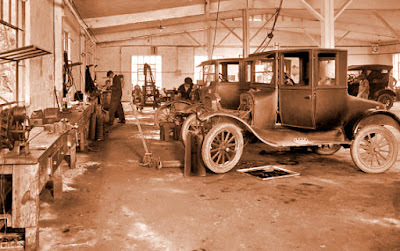 They also lamented that a service technician was on sick-leave as well. More work, less staff; I understand to a point. Here was my problem: The weekend was two days away and I had out-of-town friends coming over. The bearing in my Quantum powerchair had disintegrated - with parts spilling out from the assembly. 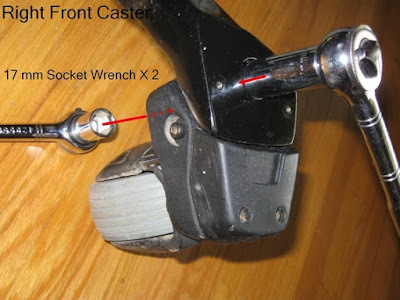 I need a technician to replace the bearing in my front caster so that I can enjoy the weekend with my overnight guests. No chance: TWO WEEKS WAIT FOR SERVICE. So what to do? I came up with several options - none of them acceptable. My manual chair has canted wheels and will not fit through most of the doors in my home. I settled on dismantling the caster wheel assembly and taking the broken wheel/bearing down to Motion Specialties and sitting there in their lobby until I received service. Luckily things worked out and my faith was somewhat restored. They had two new front wheels including casters in stock and I was able to purchase them (no questions asked). I bought the two reasoning if one was in such bad shape, the other probably is too. 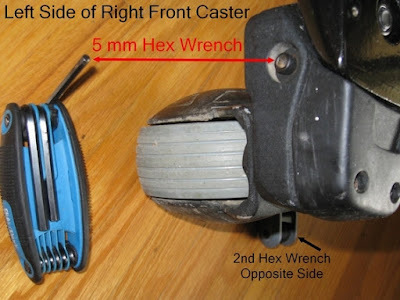 The bearings appear to be fitted to the caster wheel such that they are one unit and they are sold as such. As I was prepared to do the work myself, I saved the cost of the service call! With only hours to go before my friends arrived, I regret that I didn't take photos of the process. 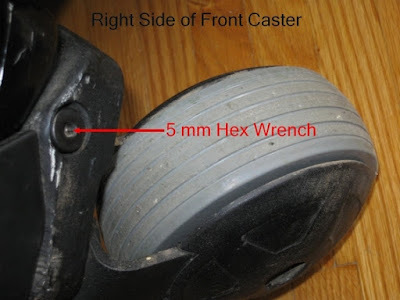 However, for those who are capable and find yourself in a similar situation, below is what I did to change over the caster wheels. A photo of the Quantum's front caster wheels removed. 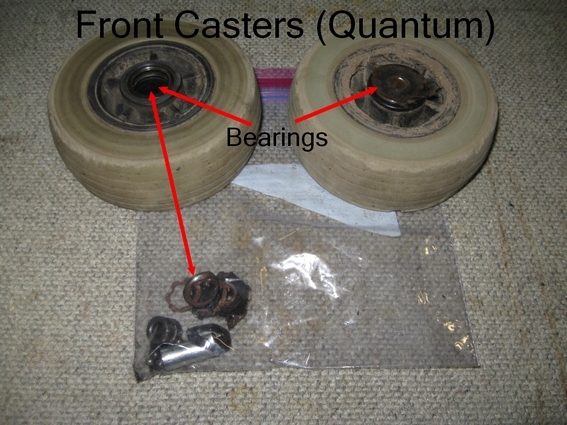 The wheel to the left shows the bearing removed with remaining contents in the plastic bag beneath. The right wheel shows an intact bearing withing the wheel. The axle runs through the smaller hole in the center of the bearing. Start by removing the rear cap by unscrewing the two Phillips screws. *The Pozi-nut is a self-locking nut which prevents the unintentional loosening of the unit during usage. It may go by other names depending on manufacturer/country, etc. Note: When you remove the nut, the bolt can be pulled out through the bottom. Caution: The bolt holds a spring sandwiched between two cupped washers (upper and lower). When assembled, this appears to act somewhat like an initial shock-absorber. Additional springs on the caster arms further soften the ride. (not shown) Over tightening compresses the spring such that there would not be one there. 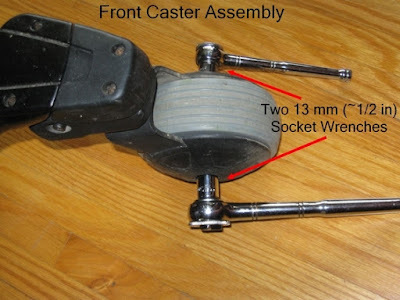 Next you will need two 5 mm hex wrenches for opposite sides of the caster assembly. While the bolt that was removed above holds the wheel to the frame and acts as an initial shock-absorber, the hex nuts secure an axle along which the wheel can move up and down along bumps, cushioned by the spring on the previous bolt. One hex nut is short (remember which side -will go in one way properly) and the other hex is part of the axle bolt. Once the smaller hex nut is removed, use the hex wrench to push the bolt through the shaft in which it sits. 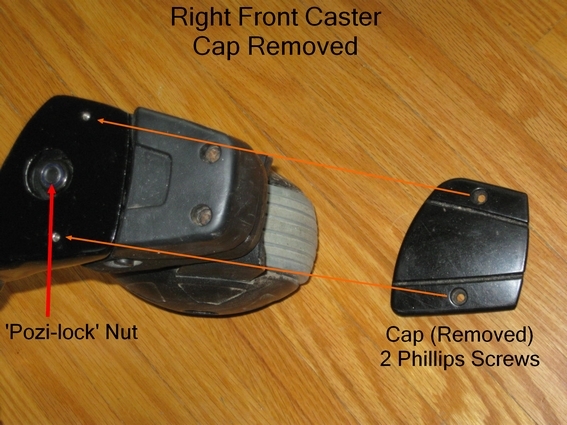 With these two items removed, the caster assembly should be free of the chair and can be removed to be worked on on a table or in your lap. The previous photo showed the hex bolt on the inside (left side) of the caster assembly. This photo shows the opposite side (larger face) of the hex nut. (this is why you should remember which directin the bolt went in). Hex wrenches in turned opposite directions loosens this bolt/axle for removal. I had the wheel in my lap when I did this; recreated here for effect. Two 13 mm socket wrenches turned in opposite directions (or hold one in place and turn the other) loosens the wheel axle proper. It can be pushed through releasing the rubber wheel from the mount. Careful as other metal washers will also come along - keep track of where these come from and replace when reassembling. These washers generally act as 'spacers' or provide a more robust surface against which the bolt heads reside. When reassembling, everything goes back in reverse. You may find a tiny ring floating within the bearing which may impede the axle being placed through the tunnel. I placed the wheel sideways on a flat surface used a small shaft screwdriver to center this ring so that the wheel axle passes through unimpeded. I probably should change the rear caster wheels as well but I think that they generally get less pounding than the front ones and are probably in not as bad shape. They are also somewhat larger in diameter but are probably easier to disassemble. I put this Quantum chair through some very heavy usage at my new home. I was doing some landscaping in my back yard and probably shoveled a ton of soil in the process. The large, square patio stones have shifted over the years with frost heaves and between soil movement and weed growth between the cracks. Crashing through, over and getting stuck in between the patio stones put a lot of pressure on the wheels bearings and suspension. At least the Quantum runs. The Permobil sits ant my other residence (still in the process of moving) and often fails to move on a flat, even surface.